Quintet are a collective of ‘bright young things’; resurrecting the songs, instruments and techniques of an otherwise forgotten era, with an irresistible sense of ease and exuberance. The washboard fidgeting, banjo rolling, horn howling collective of ‘sizzling swingsters’ have been scorching audiences with their hot-jazz on an international scale since 2012, with headline performances at WOMAD, Latitude, Wilderness and Upton Jazz festival. 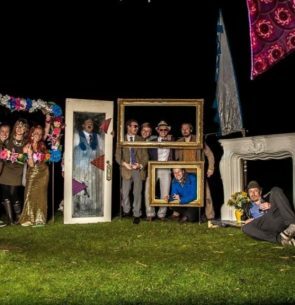 Drawing on diverse influences from Gypsy Jazz to Dixieland and R&B, the band go beyond the confines of your average Trad Jass Repertoire, with their ‘Vintage Versions’ of modern Pop classics such as Toxic, Sing it Back, I bet that you look good and the dance floor, and many more!